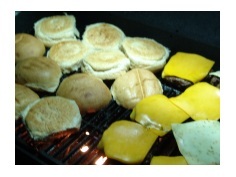 Grilling hamburgers or cheeseburgers is one of the most frequently fixed meals for people who love to BBQ, or to grill, to be more accurate. When grilling burgers, most outdoor chefs forget and/or ignore a few basic principals that result in a semi-oval meatball that is burned around the edges and sometimes kind of raw in the middle. And if you haven't learned this yet, undercooked ground beef is a real "no-no"
Let's cover a few basics that will make your next grilling attempt a success and the culinary star of your household. Proper Meat: With today's emphasis on health, everyone tries to eliminate fat. 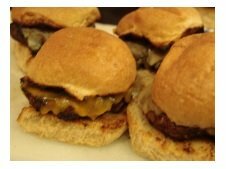 This is not good for hamburger, as it is the fat that keeps the hamburgers moist and provides flavor. I think 20% fat content is perfect. Flavoring: You can have some fun with this, but don't overdo it. If you have good beef, you want to taste it. Proper Patty Preparation: This is HUGE. Flatten the patty and then add a concave indentation in the middle. Watch the video if this doesn't make sense. This step eliminates the half raw meatball result that most backyard grillers are known for. Grill Preparation: Whether using gas or charcoal, make sure the grill is preheated and the grill surface is scraped with a wire brush after it is preheated. You may want to rub it down with some cooking or olive oil as well. Technique: Once you start grilling the hamburgers, do not leave them! Also, do not press down on them! That will turn them to leather. Wait for the fluids to start collecting in the indention, as that is the perfect time to turn them. Buns: Do something unique with the buns. Toast them or steam them, and think about using alternatives from your bakery or try english muffins which adds some great texture.